Balancing the demands of being a college student and a college athlete is a super-human feat. But how about finishing both an undergraduate degree and a Master’s degree in that same time frame, while being a leader both on and off the court? Three Pac 12 seniors are each putting finishing touches on that accomplishment this season. All completed their undergraduate degrees in three years and are wrapping up Master’s degrees this season. Each has also been a role model for their teammates in countless ways. Though their journeys have differed, each hoops star has shown that through discipline and focus, anything is possible. 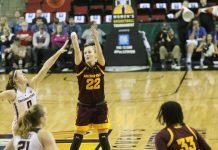 Courtney Jaco has risen to second on USC’s all-time three-point scoring list while attaining a Bachelor’s degree, a Minor and a Master’s degree. Photo by TGTVSports1. During her first season in Troy, Jaco’s sharp-shooting skills helped the team win their first-ever Pac 12 Tournament title and a trip to the NCAA Tournament. Subsequently, Jaco settled into a solid three-point shooting role while remaining extremely reliable, as she hasn’t missed a game in four years. Going in to this weekend’s match ups with the Oregon schools, Jaco ranks second on USC’s all-time three-point shot list, with 198 made. As the Trojan’s starting point guard for the last two seasons, Jaco’s vocal leadership has helped push the team through some tough times that have included roster and line up changes. Last spring, at the end of her junior year, Jaco earned her Bachelor’s degree in psychology, with a Minor in occupational therapy. She got started soon after on her Master’s degree in communication management, which she will wrap up in May. Jaco, a Los Angeles native, said she had always planned to graduate early by taking summer classes. Jaco said attending the prestigious Windward School helped prepare her for the academic rigor of college. But sandwiching two degrees in four years with student athlete demands was still a challenge. Trojan coach Cynthia Cooper-Dyke said Jaco has been a role model to her teammates because of her maturity and her relentless drive. “Courtney has a great spirit and a great heart. She’s a great teammate and a fierce competitor. That kind of balance has been very unique, because you don’t always see that type of balance in an athlete,” Cooper-Dyke said. Jaco hopes to play professional basketball. After that, she aims to try coaching. Kelsey Moos has earned her Bachelor’s degree, a Minor and a Master’s degree while serving as a poised and mature team leader for Arizona State. Photo courtesy of Sun Devil Athletics. 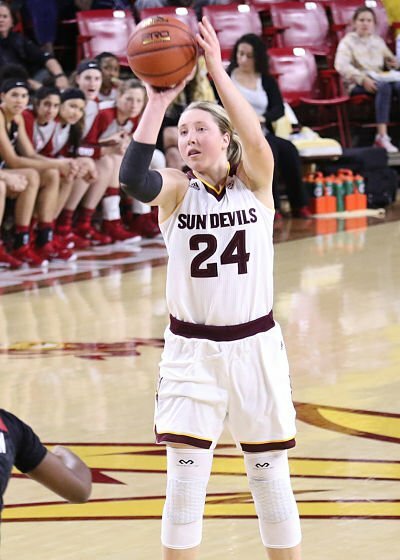 Washington native Moos has been a solid presence for the Sun Devils during her tenure, starting 89 of 91 career games and ranking first or second on the team in rebounds in each of her first three years. Her poise on the court has belied her age. This season Moos has been one of only four seniors on a team with five freshmen and three sophomores, and which has dealt with its share of injuries. Coach Charli Turner Thorne has been happy to let Moos help her lead. Moos earned her Bachelor’s degree in communications, with a minor in sales and marketing, in three years. She will complete her Master’s degree in liberal studies in May. She said finishing early wasn’t her original intention. “That was not my plan at all, but doing summer school helped a lot getting those extra classes in and then before I knew it I was almost done,” Moos said. Moos had to carry that discipline into her student-athlete journey. Moos said she’d like to work in the agricultural industry after graduation, but she’s not sure yet about what capacity that will take. “Growing up on a family farm, agriculture was really important to me and that is something I want to continue to do for the rest of my life,” she said. Jacinta Vandenberg has finished a Bachelor’s and Master’s degree while changing schools, and now mentoring a team of underclasswomen. Photo by Eric Evans Photography. Vandenberg, a 6-5 forward from Australia, began her career at Fresno State, but transferred to Oregon in 2014, shortly after Kelly Graves was named head coach. 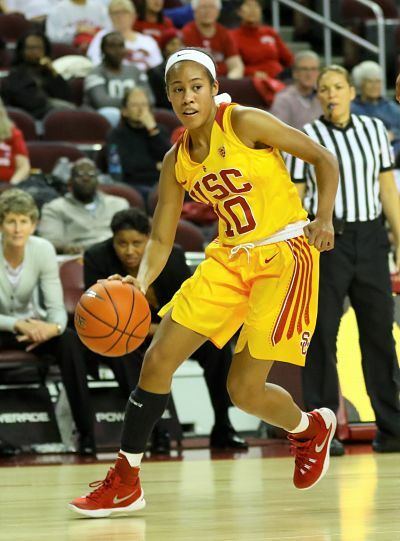 During her redshirt season she participated in all practices, and finished her Bachelor’s degree in social science in August, 2015. She will earn her Master’s degree in conflict and dispute resolution this spring. She started 28 of 34 games last year and was the team’s blocked-shots leader. 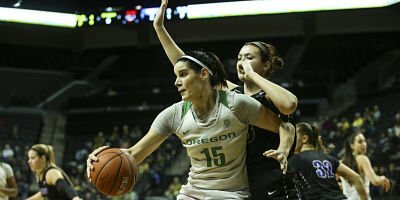 This season, Vandenberg finds herself the lone senior forward for the Ducks, who had the nation’s No. 1 recruiting class last year. 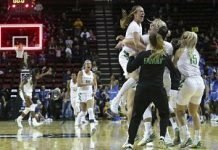 She is mentoring four freshmen and two sophomore forwards in a season that has them currently fifth in Pac 12 standings. Vandenberg said she was motivated as a freshman by seniors on the team who finished their degrees early. She said coordination is the key to success. Graves said it was easy for he and his staff to support Vandenberg through her student-athlete journey. “For her graduate work she had a choice of taking a class for six weeks or doing a day and a half seminar. She’s such a smart basketball player – we told her to just miss practice. We love working with her,” Graves said. Vandenberg isn’t sure yet about her plans after her basketball career is over, but said she’d like to work with at-risk youth, or in the mental health arena. Graves is confident that no matter what she chooses, she will be successful. “Whenever we do community service, she’s the first to volunteer,” he said. “She loves kids, and in her first year she babysat (assistant coach) Jodie Berry’s kid. She’s an incredible human being.